Different types of stars have different temperatures and lifetimes. Cooler red M-class stars live a long time, while hotter blue A-class stars have relatively brief lives. These four pictures are actually four different views of our own star, the sun. 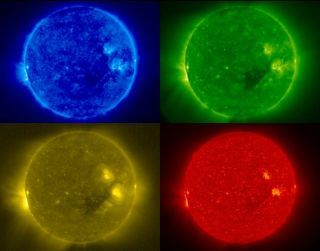 Each false-color view highlights atomic emission in different temperature regimes of the upper solar atmosphere. Yellow is 2 million Kelvin, green is 1.5 million K, blue is 1 million K, and red is 60 to 80 thousand K.
Everyone knows that we as humans literally owe the air we breathe to the greenery around us. As school children we learned that plants (as well as algae and cyanobacteria) perform the all-important biological "magic trick" known as photosynthesis, which helps generate the atmospheric oxygen we take in with every breath. Plants, algae and cyanobacteria alter our planet in a way that only life can: they use photosynthesis to completely change the composition of the Earth's atmosphere. Since the days when dust devils on Mars were suspected to be the seasonal variation of vegetation, photosynthesis has been considered a key to identifying the presence of life on other planets. Both atmospheric oxygen (in the presence of liquid water) and the reflectance spectrum of plant leaves produce signs of life — dubbed "biosignatures" — that can be seen from space. Therefore, photosynthetic biosignatures are a priority in the search for life on planets in distant solar systems. The big question is, will extrasolar photosynthesis use the same pigment as on Earth? Our eyes are sensitive to light which lies in a very small region of the electromagnetic spectrum labeled "visible light". This "visible light" corresponds to a wavelength range of 400 - 700 nanometers (nm) and a color range of violet through red. Until recently, scientists thought Chl a was the only photopigment used in oxygenic photosynthesis. Chl a uses photons in visible light at wavelengths of 400-700 nm. According to NASA postdoc Steve Mielke, lead author of a new study, "It was assumed that, due to the stringent energy requirements for splitting water molecules, longer wavelengths of light (which have lower energy) could not be used for oxygenic photosynthesis." That assumption changed in 1996 when Hideaki Miyashita and colleagues discovered a cyanobacterium named Acaryochloris marinathat uses chlorophyll d (Chl d) instead ofChl ato perform oxygenic photosynthesis with photons from visible light through to wavelengths up to 740 nm in the near-infrared (NIR). This discovery raised many questions about the wavelengths of light required for photosynthesis. Scientists wondered how difficult it was for A. marina to power biochemical reactions with low energy photons. It survives in environments where there is little visible light, because it gets the photons left over by Chl a organisms. However, could A. marinabe regularly unsuccessful in using the longer-wavelength photons, and could its ability to use NIR be inefficient, at the edge of what the molecular mechanisms of oxygenic photosynthesis are able to handle? Or could these unique organisms actually thrive on low-energy photons? New research has shown that A. marinadoesn't struggle at all when living on low-energy photons. In fact, the cyanobacterium is just as efficient or more so in storing energy as organisms that rely on Chl a for photosynthesis. Mielke and collaborators used a technique called pulsed time-resolved photoacoustics (PTRPA)to compare the photosynthetic abilities of A. marinato a Chl a cyanobacterium named Synechococcus leopoliensis. PTRPA involves laser pulses at controlled wavelengths and allowed the team to measure the efficiency of photon energy storage (energy stored vs. energy input) of cyanobacterial cells. When testing Chl d and Chl a at the wavelengths they each need to split water molecules, the team showed that whole-cell energy storage in A. marinawas just as — and sometimes more— efficient than the S. leopoliensis cells using Chl a. For the first time, the team showed that oxygenic photosynthesis can operate well at longer wavelengths. In the process of photosynthesis on Earth, plants convert energy from the sun into chemical energy in the form of glucose, or sugar. The chlorophyll in plants absorbs more blue and red light from sunlight, and less green light. Chlorophyll is green, because it reflects green light more than blue and red light. Nancy Kiang of the NASA Goddard Institute for Space Studies (GISS) explained, "Chl d extends the useful solar radiation for oxygenic photosynthesis by 18 percent — meaning life can use more wavelengths of light (i.e. more types of light-producing stars) to survive. This implies a lot of cool things." Kiang emphasized the implications that the findings could have in the search for life on alien planets, and the future of life here on Earth. For instance, Kiang said that A. marinaappears to have evolved relatively recently, occupying a light niche that is produced by leftover photons from Chl a organisms. Since it can use more solar radiation than Chl a organisms, might our planet evolve to have Chl d outcompete Chl a? Also, "Planets orbiting red dwarf stars may not get much visible light, but they’ll get a lot of NIR light,” she said. “So, now we know it would still make sense to look for oxygenic photosynthesis on such planets, and we could look for pigment signatures in the NIR." Finally, Kiang said the discovery could have implications for the development of renewable energy sources. "Biomimicry of photosynthesis continues to be a quest in the development of renewable energy, but no one has yet developed an artificial system as good as Nature to split water,” she noted. “For renewable energy that depends on sunlight, do the lower energy photons used with Chl d mean that we don’t need such strong artificial catalysts for producing hydrogen fuel and biofuels?" The findings could completely change our understanding of a biological reaction that is essential to the modern biosphere of Earth, researchers say. The results may also open new doors for the future of humankind in areas like renewable energy. But for NASA, the study could also have implications for the future of life on Earth and beyond that are truly far out. This work was conducted by NASA Postdoctoral Program fellow Steven P. Mielke, under the advisement of Nancy Y. Kiang at GISS, in the laboratory of David Mauzerall at Rockefeller University in New York City, and in collaboration with Robert Blankenship at Washington University in St. Louis, MO, and Marilyn Gunner at City College of New York.